China’s J-20 stealth fighter was a disappointment at the 2018 edition of the country’s biennial air show in Zhuhai in southern China. Three of the twin-engine warplanes put on what one reporter called a “conservative” aerial display lacking quick turns and other high-energy maneuvers. Likewise, it was apparent that the J-20s at Zhuhai didn’t feature the latest, Chinese-made WS-15 engine, and instead were still flying with older, Russian-made AL-31 engines. But fighter type’s unimpressive air-show performance probably isn’t indicative of its usefulness in combat, nor of the transformation of Chinese air power that it’s helping to propel. The J-20 first appeared in public in blurry photos that circulated on-line in late 2011, surprising foreign observers and even some military officials who assumed Beijing would need more time to complete a true stealth fighter. A low-observable warplane design requires precise shaping and hard-to-manufacture radar-absorbing materials. Mastering those qualities is expensive and time-consuming. Before the J-20 finally entered front-line service in September 2017, only the United States was capable of designing, building and operating stealth fighters. But with strong government support and benefiting from intensive industrial espionage targeting U.S. and European aerospace firms, China’s aviation industry has developed quickly in recent decades. “We have become capable of designing and making what we want to have,” Yang Wei, AVIC’s deputy director of science and technology, told the government-owned China Daily newspaper in March 2018. The J-20 in many ways is the main focus of Beijing’s military aviation modernization efforts. A prototype flew for the first time in January 2012. Subsequent prototypes benefited from a steep learning curve, boasting tighter manufacturing tolerances, more sophisticated coatings and better sensors. J-20s began taking part in realistic war games as early as March 2017, flying alongside H-6 bombers and J-20 transport planes. By mid-2018, AVIC had built around 20 J-20s against an apparent requirement for at least 200 of the type, and was continuing to improve the plane. Critics point out the J-20’s weaknesses compared to the U.S.-made F-22 and F-35 stealth fighters. The J-20’s frontal canards boost its radar signature. Its greater size and weight could reduce its maneuverability. Flying with stock AL-31 engines rather than custom-made WS-15s holds back the fighter’s performance. But no one disputes that the J-20 is stealthier than older Chinese fighter types are. No one disputes that it’s fast and boasts a capacious weapons bay and a long range of a thousand miles or more. 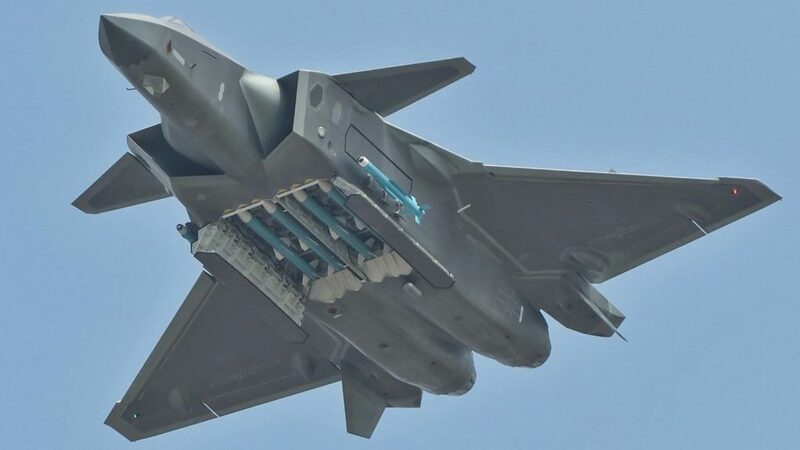 Just because the J-20 isn’t a clone of the F-22 or F-35 doesn’t mean it’s not an effective warplane and a great improvement over older Chinese fighters. No fighter exists in a vacuum. Warplanes equip squadrons staffed by human beings who support military operations in pursuit of national strategy. China’s strategic goals are to annex Taiwan, extend its influence around its periphery and secure its vital trade routes across the Pacific and Indian Oceans and the Eurasian landmass. For that strategy, anti-access operations — in particular, limiting the ability of the U.S. Navy to intervene — perhaps matter most. The U.S. Naval War College claimed the J-20 could be an “effective surface-attack platform for out to several hundred nautical miles at sea.” Likely able to strike American ships and naval planes at great distance with a higher chance of survival than older fighters could do, the J-20 could make Chinese squadrons more effective. Assuming, of course, that the type’s pilots possess the skill to operate it. And they probably do. In May 2018, J-20s participated in a mock encirclement of Taiwan that the Chinese air force claimed reflected “actual war conditions.” China appears to be training up good pilots for a new fighter whose attributes contribute to a sound national strategy. By those measures, the J-20 is already successful design and a boon to China’s power. Disappointing air shows are irrelevant, as are direct comparisons to the F-22 or F-35 or any other fighter.